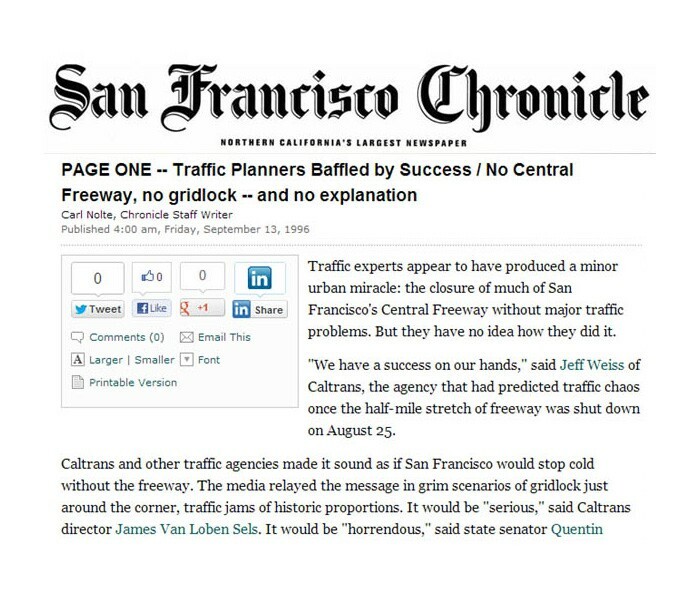 Where will all the traffic go? Interstate highways running through dense city centers strangle the potential for those cities to flourish. The highways are falling apart anyway; let’s tear them down. The timing is perfect. The most loved cities in the world — like Paris, London, New York, San Francisco — are walkable, safe, and have wide range of services, parks and other amenities in close range to each other. They are “congested” in a good way. Younger americans (millennials), young professionals, and even affluent retirees are increasingly moving to more vibrant downtown areas to attain a more walkable life. At the same time, America’s postwar highway infrastructure is crumbling and cities are faced with a hefty repair bill they can’t afford. This is a huge opportunity for many cities — like Buffalo, Cleveland, Dallas, Detroit, New Orleans, Louisville, and Seattle — to do something great. They all have deteriorating highways which are destroying their potentially most desirable properties. These highways concentrate traffic in a way that creates pedestrian barriers and discourages the building of rich communities. Whenever the general public hears about a proposal to remove part of a inner-city highway, they part into two initial camps. A minority immediately understand the benefit and historical precedents for removing portions of these highways. However, the majority of people initially support the status quo and cry out, “OH GOD, WHERE WILL ALL THAT TRAFFIC GO!” Because of this fear, many cities end up reinforcing and expanding highways, which makes the traffic worse. This is called “induced demand.” When a highway becomes bigger, it draws in more traffic. Regional Dispersion. Much of the traffic disappears immediately because it’s just passing through to a farther destination. When the West Side Highway in NYC came down, 53 percent of traffic just disappeared because it was cars in New Jersey enjoying a short-cut, but destroying NYC in the meantime. A variety of highways around the city can take on this traffic. This is why they exist. Intra-city highways (which Eisenhower opposed) pull traffic away from the grid and concentrate it in a way that makes it impossible for people to develop residencies and/or businesses. Local Dispersion. Density of intersections open up possibilities for other modes of transportation like walking, biking, or public transit. Interestingly, when a smaller grid of boulevards are intact and fully utilized, they can carry much more capacity than a highway. This is why Montreal prohibited them in the first place, they found the grid can handle twice the capacity of any highway. And now it’s considered one of the most livable cities in the world. New Proximities: When a city successfully builds a rich network for social and economic exchange, the need to travel such long distances for daily tasks falls sharply. Do you want to eat, do dry-cleaning, or see a movie? Just walk down the street. A developed street & block structure can meet most needs and results in a variety of other benefits like saved car expenses, increased safety, better tax-base, and more jobs. While the local data seems like a slam dunk (to me), I find the historical examples most powerful because they get around needing to answer every little local concern that someone might raise. The examples below are well known, but Patrick has culled together quantified data on each city in a way that rises above argumentation. His numerous sources are listed at the bottom of this page. Previously carried 100,000 cars per day. One of the more famous international examples because the busy central highway was hiding the natural river running through the city. If your city faces this debate, start fighting and help to educate your peers, particularly around the affected areas. There are many resources for more information online like the Congress of New Urbanism, which keeps track of what’s happening around the country. Ultimately this kind of initiative requires a political champion, so research your local representatives and vote. We have the power to make our cities great, but the status quo will always be the greatest enemy of progress.